Although Th1, Th2, and Th17 cells are thought to be major effector cells in adaptive alloimmune responses, their respective contribution to allograft rejection remains unclear. To precisely address this, we used mice genetically modified for the Th1 and Th17 hallmark transcription factors T-bet and RORγt, respectively, which allowed us to study the alloreactive role of each subset in an experimental transplant setting. We found that in a fully mismatched heterotopic mouse heart transplantation model, T cells deficient for T-bet (prone to Th17 differentiation) versus RORγt (prone to Th1 differentiation) rejected allografts at a more accelerated rate, indicating a predominance of Th17- over Th1-driven alloimmunity. Importantly, T cells doubly deficient for both T-bet and RORγt differentiated into alloreactive GATA-3–expressing Th2 cells, which promptly induced allograft rejection characterized by a Th2-type intragraft expression profile and eosinophilic infiltration. Mechanistically, Th2-mediated allograft rejection was contingent on IL-4, as its neutralization significantly prolonged allograft survival by reducing intragraft expression of Th2 effector molecules and eosinophilic allograft infiltration. Moreover, under IL-4 neutralizing conditions, alloreactive double-deficient T cells upregulated Eomesodermin (Eomes) and IFN-γ, but not GATA-3. Thus, in the absence of T-bet and RORγt, Eomes may salvage Th1-mediated alloimmunity that underlies IL-4 neutralization-resistant allograft rejection. We summarize that, whereas Th17 cells predictably promote allograft rejection, IL-4–producing GATA-3+ Th2 cells, which are generally thought to protect allogeneic transplants, may actually be potent facilitators of organ transplant rejection in the absence of T-bet and RORγt. Moreover, Eomes may rescue Th1-mediated allograft rejection in the absence of IL-4, T-bet, and RORγt. CD4+ Th cells play a critical role in driving alloimmune responses in bone marrow and solid organ transplantation (1). Depending on the cytokine milieu, CD4+ effector T cells primarily differentiate into a Th1, Th2, Th9, or Th17 phenotype with different cytokine profiles and distinct functions. Th1 differentiation is initiated through an IL-12/STAT-4–mediated induction of the T-box transcription factor T-bet, leading to enhanced production of IFN-γ. Mechanistic studies demonstrated that, apart from regulating Th1 differentiation, T-bet also actively suppresses the Th2 cell–specific transcription factor GATA-3 (2, 3) and the Th17 hallmark transcription factor RORγt (4). In transplantation it is well established that graft-versus-host disease (GVHD) and allograft rejection are predominantly Th1 driven, but can also be mediated by Th17 cells (1, 5). The role of Th2 cells in alloimmunity, however, remains ambiguous. Whereas some studies suggested that Th2 cells can mediate GVHD and promote allograft rejection (6–9), recent data in T-bet (Th1) and RORγt (Th17) knockout models indicate that Th2 cell polarization may ameliorate acute GVHD and favor allograft survival (5, 10). Consistent with this idea, it was recently reported that mice deficient for both T-bet (Th1) and RORγt (Th17) fail to induce acute GVHD in bone marrow transplantation, suggesting only a minor role of Th2 cells in destructive alloimmune responses (10). In this study, we initiated experiments in T-bet– and RORγt-deficient mice to test the effects of a Th2-predominant environment on organ transplant rejection, with expectations that Th2 cell predominance might protect organ allografts. To the contrary, we found that Th2 polarization does not promote tolerance in this model, but rather causes early severe heart and skin allograft rejection associated with eosinophilic infiltration. Such Th2-mediated allograft rejection was dependent on IL-4, neutralization of which induced Eomesodermin (Eomes)-expressing IFN-γ+ Th1 cells that may trigger anti–IL-4–resistant allograft rejection in the absence of T-bet and RORγt. Six- to 8-wk-old wild-type (wt) (C57BL/6J and BALB/c) mice were purchased from Charles River Laboratories (Sulzfeld, Germany). RORγtgfp/gfp mice were purchased from Jackson Laboratories (via Charles River Laboratories) and crossbred with T-bet−/− mice (Jackson Laboratories, via Charles River Laboratories). Genotyping confirmed the RORγt and T-bet deficiency. RAG common γ-chain (B6.Rag-γc) double knockout (DKO) mice were purchased from Taconic (Petersburgh, NY). Animal experiments were carried out according to the regional rules and regulations of Upper Palatinate, Germany. In a MHC full-mismatched model, B6.RAG-γc mice were used as recipients of BALB/c tail skin or heart allografts. Skin transplantation (STx) and rejection scoring were performed, as previously described (6, 11, 12). Abdominal heterotopic heart transplantation (HTx) and assessment of graft function were done, as described (5, 13). Seven days after transplantation, purified CD3+ T cells (2 × 106) from the various mouse strains were adoptively transferred via the tail vein into the STx or HTx recipients. Neutralizing IL-4 mAb (clone 11B11; BioXCell) was administered i.p. at a dosage of 1 mg on days 0, 2, 4, and 7 after T cell transfer, followed by weekly applications. Skin and heart allografts were harvested at day 10 or at the time of rejection, respectively. The grafts were embedded, transversely sectioned, and then H&E stained. Flow cytometer–sorted CD4+ T cells retrieved from wt, T-bet−/−, RORγtgfp/gfp, and RORγtgfp/gfpT-bet−/− spleens were stimulated with anti-mouse CD3 Ab (2 μg/ml, clone 145-2C11; BD Biosciences, Heidelberg, Germany) and then cultured under conditions favoring the following: 1) Th0 cells: anti-mouse IL-4 Ab (10 μg/ml, clone BVD4-1D11; BD Biosciences) and anti-mouse IFN-γ Ab (10 μg/ml, clone R4-6A2; BD Biosciences); 2) Th1 cells: mouse IL-12 (10 ng/ml; R&D Systems, Minneapolis, MN) and anti-mouse IL-4 Ab; or 3) Th17 cells: human TGF-β (2 μg/ml; R&D Systems), mouse IL-6 (30 μg/ml; R&D Systems), mouse IL-23 (50 μg/ml; R&D Systems), and anti-mouse IL-4 and anti-mouse IFN-γ Abs. Cells and supernatants were harvested for flow cytometric, RT-PCR, or ELISA analyses (after 5 d). Whole spleens and hearts were dissected into single-cell suspension; hearts were additionally incubated with collagenase type II (0.1818 mg/ml, CII-22; Biochrom, Berlin, Germany) and DNase I (0.05 mg/ml, DN25; Sigma-Aldrich, St. Louis, MO). Cell suspensions were activated, as indicated, before restimulation with PMA (50 ng/ml) and ionomycin (550 ng/ml). Cells and supernatants were harvested for flow cytometric analysis and ELISA, respectively. ELISA kits were used to measure IL-17A (R&D Systems), IL-4 (R&D Systems), and IFN-γ (BD Biosciences). Flow cytometer sorting was performed on a FACS ARIA (BD Bioscience). A FACSCanto II (BD Biosciences) was used for flow cytometric analyses (Flowjo software; Tree Star, Ashland, OR). Cells were stained with Abs shown in Supplemental Table 1A. mRNA isolation, cDNA reverse transcription, and RT-PCR were performed, as previously described (14, 15). Customized primer sets for murine IL-17A, GATA-3, IL-4, IL-5, IL-13, IFN-γ, and GAPDH were obtained from Qiagen (SDC4; Supplemental Table 1B). Results are expressed relative to GAPDH using the 2−ΔCt method. Data were analyzed using nonparametric t tests (Mann–Whitney) or survival log-rank tests, as appropriate. To scrutinize the impact of the respective Th cell subsets on acute allograft rejection, we developed RORγt knockout mice on a T-bet–deficient (T-bet−/−) background by crossbreeding B6.T-bet−/− with B6.RORγtgfp/gfp mice. The B6.RORγtgfp/gfp mouse is characterized by the insertion of enhanced GFP into the Rorc gene locus, which reports on RORγt transcription, and simultaneously inhibits RORγt-mediated Th17 cell differentiation (16). First, we explored the reporter capacity of our model by polarizing flow cytometer–sorted CD4+ T cells from the distinct mouse strains (wt, T-bet−/− [non-Th1], RORγtgfp/gfp [non-Th17], RORγtgfp/gfpT-bet−/− [DKO; non-Th1/Th17]) toward a Th17 phenotype by measuring GFP expression. As expected, T cells from RORγtgfp/gfpT-bet−/− (DKO) and RORγtgfp/gfp mice expressed high GFP levels, demonstrating proper Rorc-reporter function (Fig. 1A). Next, we tested T cell effector capabilities in the absence of T-bet, RORγt, or both genes by polarizing flow cytometer–sorted CD4+ T cells from wt, T-bet−/−, RORγtgfp/gfp, and RORγtgfp/gfpT-bet−/− mice toward a Th1 or Th17 phenotype. To assess polarization, expression levels of the Th1 and Th17 effector cytokines IFN-γ and IL-17A, respectively, were measured by flow cytometry and RT-PCR or ELISA after 5 d of culture. In the absence of T-bet, CD4+ T cells express relatively high IL-17A levels under Th17 conditions and expected low levels of IFN-γ under Th1-polarizing conditions (Fig. 1B, 1C). In contrast, T cells knocked out for RORγt produce high levels of IFN-γ when polarized toward the Th1 phenotype and low levels of IL-17A under Th17 conditions (Fig. 1B, 1C). Importantly, in T cells from RORγtgfp/gfpT-bet−/− mice, we found substantially lower IL-17A and IFN-γ expression under Th17 and Th1 conditions, respectively, as measured by flow cytometry, PCR, and ELISA when compared with T-bet−/− T cells (Fig. 1B, 1C). These results highlight the significance of RORγt and T-bet for Th17 and Th1 differentiation, which is in line with previous studies (17, 18). Double deficiency for T-bet and RORγt diminishes Th1 and Th17 cell differentiation in vitro. (A) Flow cytometric analysis of GFP expression in CD4+ T cells under Th0- and Th17-polarizing conditions after 5 d of culture in vitro (gated on viable CD3+CD4+ cells). (B) Flow cytometric analysis of IL-17A and IFN-γ expression under Th0-, Th17-, or Th1-polarizing conditions (5 d of culture, gated on viable CD3+CD4+ cells). Plots shown in (A) and (B) are representative results of at least five independent experiments. (C) IL-17A expression under Th0- and Th17-polarizing conditions after 5 d of culture as measured by RT-PCR (top) and ELISA (middle). IFN-γ mRNA expression (bottom) under Th0- and Th1-polarizing conditions as determined by RT-PCR. These results are representative data of at least four independent experiments. To evaluate the contribution of alloreactive Th1 versus Th17 cells in acute allograft rejection in a well-established allosensitization model in vivo, we adoptively transferred purified T cells from the various T-bet and RORγt knockout animals into B6.RAG-γc−/− recipients of a fully mismatched BALB/c STx. Skin grafts were promptly rejected by all mice deficient for T-bet or T-bet and RORγt (Fig. 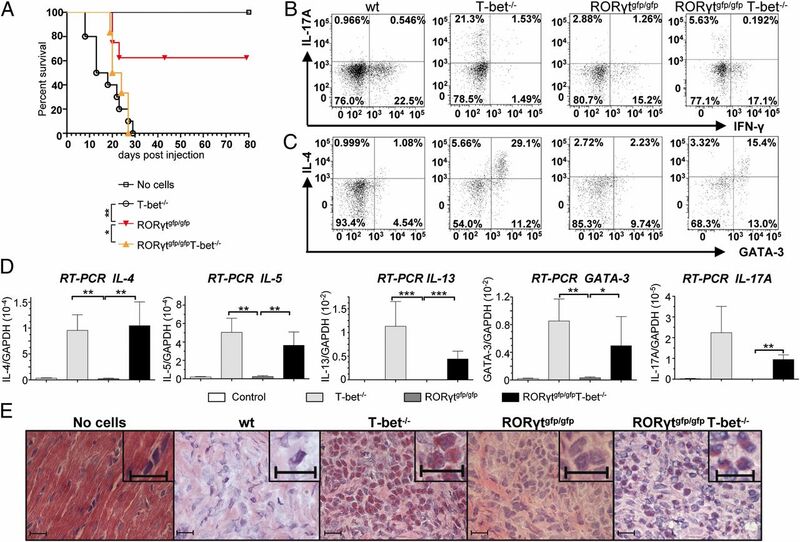 2A); T cells single deficient for RORγt promoted a weaker rejection response, with a nonsignificant trend toward prolongation of graft survival. Detailed studies of allografts and T cells recovered from the groups of STx recipients at the time of rejection revealed important differences. Consistent with our in vitro results, recovered and ex vivo restimulated T cells from RORγtgfp/gfp mice expressed relatively high IFN-γ levels, whereas low expression levels of IL-17A were evident (Fig. 2B, 2C). Recovered T cells from mice receiving T-bet−/− T cells had a reciprocal expression pattern (Fig. 2B, 2C). Moreover, STx recipients given RORγtgfp/gfp and T-bet−/− cells also differed in their expression of the Th2 signature cytokine IL-4; RORγtgfp/gfp T cells produced lower levels of IL-4 when compared with T-bet−/− T cells (Fig. 2B). Critically, recipients transferred with RORγtgfp/gfpT-bet−/− T cells featured diminished levels of IL-17A and IFN-γ, but appreciable levels of IL-4 and GATA-3 consistent with a strong Th2 alloresponse (Fig. 2B, 2C). Histology of rejecting skin allografts from recipients transferred with T cells from RORγtgfp/gfp mice revealed a conventional mononuclear cell infiltration as opposed to the predominantly polymorphonuclear cell infiltration (including eosinophils and neutrophils) in skin grafts from recipients reconstituted with T cells from T-bet−/− and RORγtgfp/gfpT-bet−/− mice (Fig. 2D). Double deficiency for T-bet and RORγt promotes alloreactive Th2 cell differentiation in STx recipients in vivo. (A) Allograft survival of BALB/c STx grafted onto B6.RAG-γc−/− recipients that were adoptively transferred with T cells from wt, T-bet−/−, RORγtgfp/gfp, or RORγtgfp/gfpT-bet−/− mice. Control recipients received no cell transfer (n = 5 each). (B) Representative flow cytometry analyses of intracellular IL-17A and IFN-γ (top) as well as IL-4 and GATA-3 (bottom) expression in ex vivo restimulated (PMA, ionomycin) splenic CD4+ T cells from the adoptively transferred STx recipients (gated on viable CD3+CD4+ cells, n = 5). (C) IL-17A protein expression in supernatants of ex vivo restimulated splenocytes from the adoptively transferred STx recipients (ELISA, n = 5 each). (D) Representative histology (H&E staining, scale bars = 20 μm) of rejecting skin allografts (day 10 postinjection). *p < 0.05, **p < 0.005. A recent study by Yu et al. (10) demonstrated that a double deficiency for T-bet and RORγt prevents acute GVHD development in a full-mismatch murine model of hematopoietic stem cell transplantation. Due to their inability to differentiate into Th1 and Th17 phenotypes, T cells in these mice preferentially commit to a Th2 fate that may be protolerogenic and protect from GVHD (10). Considering this, we tested the hypothesis in organ transplantation that Th2-oriented cells from RORγtgfp/gfpT-bet−/− mice will protect heart transplants from acute rejection. Unexpectedly, flow cytometer–sorted T cells from RORγtgfp/gfpT-bet−/− mice transferred into B6.RAG-γc−/− recipients of fully mismatched BALB/c heart allografts rejected promptly (22.8 ± 3.7 d; Fig. 3A), as well as HTx recipients given T-bet−/− T cells (19.8 ± 6.47 d; Fig. 3A). Surprisingly, HTx recipients given T cells from RORγtgfp/gfp mice failed to acutely reject their allografts with the majority (63%, n = 8) surviving long-term; prolonged allograft survival was associated with low levels of IL-17A and IL-4 and increased IFN-γ expression (Fig. 3B, 3C). In accordance with the data obtained in our STx model, T-bet−/− T cells (non-Th1) expressed relatively high levels of IL-17A and low IFN-γ (Fig. 3B). Consistent with previous studies (5), T-bet−/− T cell recipients also showed enhanced intragraft mRNA expression of the Th2-related cytokines IL-4, IL-5, and IL-13, as well as the Th2 transcription factor GATA-3 (Fig. 3D). 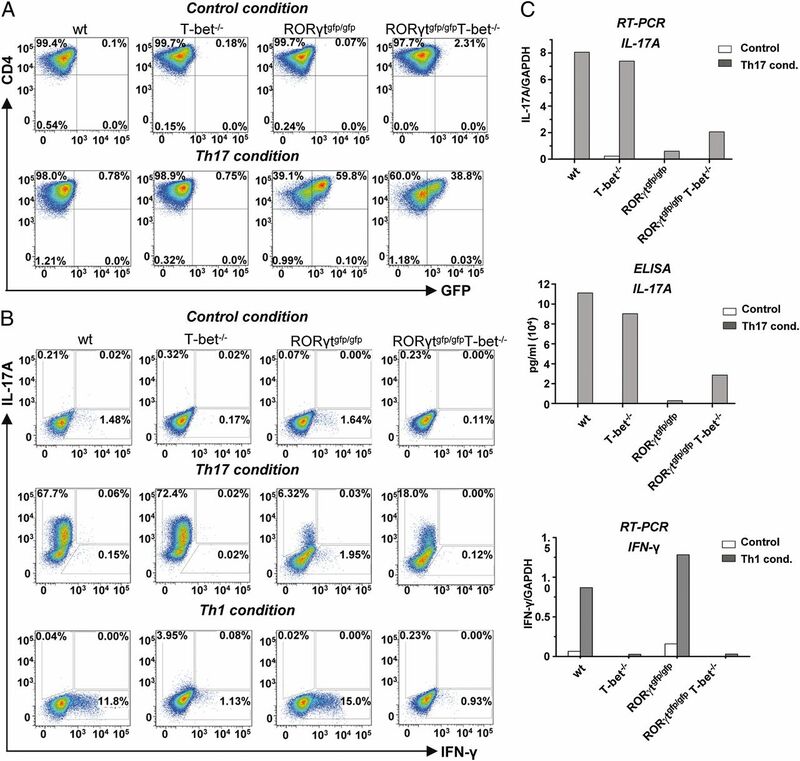 RORγtgfp/gfpT-bet−/− T cell recipients exhibited low expression of IFN-γ and IL-17A, whereas IL-4 levels were relatively increased (Fig. 3B, 3C); these results are consistent with the intragraft mRNA cytokine expression pattern (Fig. 3D). To study potential involvement of Th9 cells in the rejection process, we also measured the intragraft mRNA expression levels of IL-9. Interestingly, mRNA expression of IL-9 was very low without any differences between the various mouse strains (data not shown). Double deficiency for T-bet and RORγt promotes Th2-mediated accelerated heart allograft rejection in HTx recipients in vivo. (A) Allograft survival of BALB/c HTx grafted into B6.RAG-γc−/− recipients that were adoptively transferred with T cells from T-bet−/−, RORγtgfp/gfp, or RORγtgfp/gfpT-bet−/− mice. Controls received no cell transfer (n = 6–8 each). (B) Representative flow cytometry analyses of intracellular IL-17A and IFN-γ as well as (C) IL-4 and GATA-3 expression in splenic CD4+ T cells from rejected/ended HTx recipients after 48 h of ex vivo restimulation with donor-specific CD3− APCs (gated on viable CD3+CD4+ cells, n = 6). (D) Intragraft mRNA expression levels of IL-4, IL-5, IL-13, GATA-3, and IL-17A in rejected/ended HTx via RT-PCR (n = 5–8 each). (E) Representative histology (H&E staining, scale bars = 20 μm) of rejected heart allografts from the adoptively transferred HTx recipients. *p < 0.05, **p < 0.005, ***p < 0.001. Similar to STx, HTx mice with T cells from T-bet−/− and RORγtgfp/gfpT-bet−/− mice were heavily infiltrated with eosinophilic and only few neutrophilic granulocytes, indicating a predominance of the Th2 phenotype in these mice compared with the mononuclear cell infiltration of recipients given RORγtgfp/gfp T cells (Fig. 3E). To show the importance of Th2 responses, we tested whether neutralization of IL-4 with anti–IL-4 Ab would prolong HTx allograft survival in B6.RAG-γc−/− recipients given RORγtgfp/gfpT-bet−/− T cells. Importantly, IL-4 neutralization prolonged allograft survival (Fig. 4A), which was associated with a significant reduction of graft-infiltrating eosinophilic granulocytes (Fig. 4B, 4C). In line with this finding, flow cytometry using highly sensitive staining for eosinophils (Siglec F, CD45, CD11b, and CD11c) (19) revealed lower levels of eosinophilic granulocytes (Siglec F+ CD45+ CD11bhigh CD11clow) in allografts under IL-4–neutralizing conditions (Fig. 4D) when compared with the nontreated controls, supporting our semiquantitative histological data. Moreover, intragraft mRNA expression of the Th2-related cytokines IL-4, IL-5, and IL-13 was strongly reduced under IL-4–neutralizing conditions, whereas there were no differences in IL-17A expression (Fig. 4E). Also, we did not detect any significant expression levels of IL-9 in the various mouse strains (data not shown), indicating that Th9 cells fail to emerge under anti–IL-4 conditions in the absence of RORγt and T-bet. Importantly, however, we found a strong reduction of GATA-3–expressing DKO T cells in anti–IL-4–treated recipients (Fig. 4F), indicating that neutralization of IL-4 effectively prevents alloreactive Th2 differentiation. Interestingly, further subgroup analyses have shown a trend toward higher intragraft expression levels of IFN-γ in HTx recipients with RORγtgfp/gfpT-bet−/− T cells that rejected their allografts (data not shown). Th2-mediated allograft rejection in the absence of T-bet and RORγt is mediated by IL-4. (A) Allograft survival of BALB/c HTx grafted into B6.RAG-γc−/− recipients that were adoptively transferred with T cells from RORγtgfp/gfpT-bet−/− mice ± anti–IL-4 mAb treatment (n = 6–7). (B) Representative histology (H&E staining; scale bars, 20 μm) of rejected heart allografts from the adoptively transferred HTx recipients ± IL-4 neutralization. Arrowheads point out infiltrating eosinophils. (C) Phenotypic quantification of graft-infiltrating leukocytes. Five high-power fields were counted in three separate representative areas of tissue sections from untreated or anti–IL-4–treated adoptively transferred HTx recipients (n = 4–5 each). (D) Representative flow cytometry analyses of Siglec F and CD11b expression by graft-infiltrating leukocytes from HTx recipients ± IL-4 neutralization (gated on viable CD3−CD45+CD11clow cells). (E) Intragraft mRNA expression levels of IL-4, IL-5, IL-13, and IL-17A in rejected HTx (n = 6–8). (F) Representative flow cytometry analyses of IL-4 and GATA-3 expression in splenic CD4+ T cells from the adoptively transferred HTx recipients ± IL-4 neutralization (gated on viable CD3+CD4+ cells). *p < 0.05, **p < 0.005, ***p < 0.001. Due to the stringency and immunogenicity of our skin transplant model, neutralization of IL-4 in RORγtgfp/gfpT-bet−/− STx recipients did not result in prolonged allograft survival, but prompt allograft rejection (data not shown). Therefore, we decided to precisely study the alternative rejection mechanisms that drive allograft rejection in those skin transplant recipients. Based on our results above, we hypothesized that Eomes may be upregulated in RORγtgfp/gfpT-bet−/− T cells under IL-4–neutralizing conditions, therefore driving T-bet–independent Th1-mediated allograft rejection. We found that, in those mice, similar to in HTx recipients, eosinophilic infiltration of skin allografts was markedly reduced upon anti–IL-4 treatment (Fig. 5A). Moreover, IL-4 neutralization was further associated with significantly less splenic eosinophilic granulocytes (Siglec F+ CD45+ CD11bhigh CD11clow) and reduced levels of Th2 cytokines (Fig. 5B–D). Most importantly, we also found upregulated levels of IFN-γ in supernatants of restimulated splenocytes from those animals, as determined by ELISA (Fig. 5D). Furthermore, detailed flow cytometric analyses revealed a significant increase in Eomes-expressing IFN-γ+CD4+ Th1 cells in STx recipients that were treated with anti–IL-4 Ab (Fig. 5E). These results suggest that, in models of solid organ transplantation, T cells doubly deficient for RORγt and T-bet differentiate into Eomes-expressing alloreactive Th1 cells under Th2-blocking conditions. Eomes drives Th1-mediated allograft rejection in the absence of IL-4, T-bet, and RORγt. (A) Representative histology (H&E staining; scale bars, 20 μm) of BALB/c skin allografts from B6.RAG-γc−/− STx recipients that were adoptively transferred with T cells from RORγtgfp/gfpT-bet−/− mice ± anti–IL-4 mAb treatment (at day 14 after STx). (B) Representative flow cytometry analyses of eosinophils as determined by Siglec F and CD11b expression in splenocytes from the adoptively transferred STx recipients ± IL-4 neutralization (gated on viable CD3−CD45+CD11clow cells). (C) Quantification of eosinophils as determined by percentages of Siglec F+CD45+CD11bhighCD11clow leukocytes from total splenocytes of the STx recipients ± IL-4 neutralization (n = 6–7 mice each). (D) IL-4, IL-5, IL-13 (left), and IFN-γ protein expression (ELISA) (right) by ex vivo restimulated splenocytes from the STx recipients ± IL-4 neutralization (n = 6–7). (E) Representative flow cytometry analyses of Eomes and IFN-γ expression in ex vivo restimulated splenic CD4+ T cells from the STx recipients ± IL-4 neutralization (gated on viable CD3+CD4+ cells) (left). Quantification of CD4+Eomes+ T cells from total splenocytes of the STx recipients ± IL-4 neutralization (n = 6 each). *p < 0.05, **p < 0.005. Studies in genetically modified mice have shown that T cells deficient for T-bet (non-Th1) preferentially differentiate into Th2 and Th17 effector cells (5, 10), resulting in an aggressive alloimmune response against solid organ and hematopoietic stem cell transplants. Moreover, T cells deficient for RORγt (non-Th17) are prone to Th1 differentiation, also leading to GVHD after bone marrow transplantation (1, 10). In our transfer model of full-mismatched skin and heart transplantation, we found that double deficiency for Th1 and Th17 favors an IL-4–mediated, Th2-dependent aggressive alloimmune response leading to early allograft rejection associated with eosinophilic infiltration. IL-4–producing Th2 cells were initially believed to mediate protective and protolerogenic functions in the transplant setting due to their ability to antagonize Th1 responses. However, particularly in a Th1-deficient environment, this classic Th1/Th2 paradigm had to be questioned based on numerous studies demonstrating Th2-dependent activation of alternative rejection pathways associated with eosinophilic recruitment (6, 20–22). For instance, in bone marrow transplantation, studies by Nikolic et al. (7) in STAT4 and STAT6 knockout mice indicated that both Th1 and Th2 cells contribute to tissue-specific GVHD development particularly when one subset is deficient. Whereas Th1 cells were associated with severe intestinal GVHD, Th2 cells seemed to be critical for hepatic and skin injury in this model. In line with this, Surquin et al. (6) highlighted the importance of IL-4–triggered Th2-mediated solid allograft rejection as they showed prolonged skin allograft survival in IL-4−/− recipients in ∼50% of cases, whereas the remaining animals promptly rejected their skin allografts in a neutrophil-dependent manner. Importantly, these studies are limited by the fact that they have not considered an effector role of Th17 cells in their models, as the significance of pathological Th17 cells in alloimmune responses, particularly in the absence of Th1 differentiation, was discovered after these publications (5, 23, 24). Hence, the neutrophil-mediated skin allograft rejection in the IL-4−/− model (6) might have been caused by alloreactive Th17 cells that emerge in the absence of Th2 alloresponses. The first study indicating that Th2-mediated alloresponses may mediate an alternate pathway of destructive alloimmune responses in the absence of Th1 and Th17 was published by Yi and colleagues (9). They found that, in bone marrow transplantation, double blockade of Th1 and Th17 using an IL-17/IFN-γ DKO model leads to GVHD idiopathic pneumonia (9). However, this study was limited by the utilization of a cytokine-only deficient model. The IL-17/IFN-γ DKO model cannot eliminate the entire Th1 or Th17 effector capacity because other cytokines produced by these cells, such as TNF-α, IL-21, IL-22, and IL-23, could still mediate pathological effects. Therefore, our study was designed to help close the knowledge gap concerning reciprocal Th cell differentiation in allotransplant responses by exposing the effector roles of alloreactive Th1, Th2, and Th17 cell subsets through the use of genetically modified mice targeting the hallmark Th1 and Th17 transcription factors RORγt and T-bet. Importantly, we found that T cells doubly deficient for both transcription factors feature diminished levels of IL-17A and IFN-γ, but appreciable levels of IL-4 and GATA-3, which drive early allograft rejection characterized by strong eosinophilic allograft infiltration and intragraft expression of Th2 effector cytokines. Thus, to our knowledge, our study represents the first reported characterization of a solely Th2-driven allograft rejection. Morphologically, these Th2-rejected allografts clearly lacked neutrophilic infiltration, even under IL-4–neutralizing conditions, which can be attributed to the deficiency for RORγt (Th17) in our model when compared with previous studies (5, 6, 23, 24). Mechanistically, the Th2-mediated allograft rejection was contingent upon the expression of IL-4 and GATA-3, as neutralization of IL-4 in double-deficient recipients resulted in downregulation of GATA-3 expression and prolonged allograft survival in about one-half of the HTx recipients; allografts from long-surviving animals showed reduced eosinophilic infiltration and low Th2 cytokine levels. Thus, our findings not only illustrate the potency of exclusive Th2-dominated alloresponses in solid organ transplantation, they provide a novel mechanistic tool for comparatively studying Th1, Th2, and Th17 cell differentiation and their respective role in allograft rejection. In contrast to our findings in solid organ transplantation, Yu et al. (10) recently showed in a bone marrow transplantation model that double deficiency for RORγt and T-bet induces Th2 cell polarization that results in prolonged survival and amelioration of acute GVHD. We speculate that yet unknown bone marrow versus solid organ transplant–specific effects are accountable for this discrepancy. For instance, alloreactive T cells may require a different set of chemokine receptors and homing signals to infiltrate solid organ transplants (i.e., skin and heart) versus GVHD-targeted organs (liver, lung, bowel); this explanation could account for the higher infiltration levels of alloreactive Th2 cells in solid organ transplants observed in our study. Moreover, the process of transplanting a solid organ itself is known to initiate proinflammatory signaling directed toward the allograft that may favor early proinflammatory over regulatory T cell alloresponses. In contrast, it has been shown that T cells doubly deficient for RORγt and T-bet predominantly differentiate into Foxp3+ regulatory T cells in a bone marrow transplantation setting (10). In our study, we failed to detect an increase in regulatory T cell numbers in transplant recipients with T cells double deficient for RORγt and T-bet (data not shown). Clearly, the mechanistic controversy surrounding the differences observed between the transplant models deserves further investigation. We found that under IL-4–neutralizing conditions, T cells doubly deficient for RORγt and T-bet downregulate GATA-3 expression, but can still reject heart allografts in about one-half of recipients. This raises the question as to the mechanism of the apparent non-Th1/Th2/Th17–mediated allograft rejection. We can exclude the involvement of other Th cell subsets such as Th9 cells, as we failed to detect evidence of IL-9 expression in all transplant recipients. However, whereas we found that IL-17A production was low under IL-4 blockade conditions in DKO mice, a trend toward elevated IFN-γ expression levels in anti–IL-4–treated animals was detected. Further analyses showed that this upregulation of IFN-γ was due to an increase in Eomes-expressing CD4+ T cells. In addition to T-bet, Eomes has been shown to regulate IFN-γ expression in CD8+ T cells and NK cells, and to a lesser degree in CD4+ T cells (25, 26). Consistent with this hypothesis, Yang et al. (26) have shown a critical role for Eomes in regulating IFN-γ expression in activated CD4+ T cells as a compensatory mechanism for T-bet deficiency. Eomes expression in CD4+ T cells is normally masked by Th2 pathways, particularly in the absence of T-bet (26). Consequently, blockade of IL-4 in our model may enable RORγt and T-bet double-deficient CD4+ T cells to overexpress Eomes, which drives Th1-mediated allograft rejection in the absence of T-bet. Mechanistically, it is interesting to note in our in vitro experiments that CD4+ T cells derived from T-bet−/− or RORγtgfp/gfpT-bet−/− animals did not produce IFN-γ under Th1-polarizing conditions. However, we attribute this result to the presence of rIL-12 in our cultures, which is known to effectively inhibit Eomes expression (27). In summary, our data confirm that disrupting T-bet leads to early allograft rejection associated with an enhanced Th2 and Th17 cytokine profile (5). This observation can be ascribed to the key regulatory function of T-bet that promotes Th1 differentiation and simultaneously suppresses Th2 and Th17 polarization (2–4). Consequently, T cells deficient for both RORγt and T-bet exist in a Th1-Th17–deficient environment where Th2-related cytokine production is left unrestrained. Most importantly, although these Th2 favorable conditions have shown mostly protective effects on GVHD after hematopoietic stem cell transplantation (10), we demonstrate in the setting of solid organ transplantation that Th2 cells cause vigorous rejection responses. Finally, the current study supports the idea that blockade of IL-4 in RORγt and T-bet deficiency unmasks a compensatory function of Eomes in IFN-γ expression and Th1 differentiation, causing delayed Th1-driven allograft rejection. We thank Lydia Schneider, Kathleen Burghardt, Azucena Martin-Santos, and Irina Kucuk for excellent technical help. This work was supported by European Union 7th Framework Programme ONE Study Grant 260687 (to E.K.G., H.J.S., G.E.K., and A.K.) and Deutsche Forschungsgemeinschaft Grants KFO 243/1, KR 3631/2-1, and HU 1838/2-1 (to E.K.G., H.J.S., G.E.K., and A.K.).
. 2012. The IL-17 differentiation pathway and its role in transplant outcome. Biol. Blood Marrow Transplant. 18: S56–S61.
. 2007. Transcription factors T-bet and Runx3 cooperate to activate Ifng and silence Il4 in T helper type 1 cells. Nat. Immunol. 8: 145–153.
. 2005. T helper cell fate specified by kinase-mediated interaction of T-bet with GATA-3. Science 307: 430–433.
. 2011. T-bet represses T(H)17 differentiation by preventing Runx1-mediated activation of the gene encoding RORγt. Nat. Immunol. 12: 96–104.
. 2008. A novel role of CD4 Th17 cells in mediating cardiac allograft rejection and vasculopathy. J. Exp. Med. 205: 3133–3144.
. 2005. IL-4 deficiency prevents eosinophilic rejection and uncovers a role for neutrophils in the rejection of MHC class II disparate skin grafts. Transplantation 80: 1485–1492.
. 2000. Th1 and Th2 mediate acute graft-versus-host disease, each with distinct end-organ targets. J. Clin. Invest. 105: 1289–1298.
. 1998. Differential effects of the absence of interferon-gamma and IL-4 in acute graft-versus-host disease after allogeneic bone marrow transplantation in mice. J. Clin. Invest. 102: 1742–1748.
. 2009. Reciprocal differentiation and tissue-specific pathogenesis of Th1, Th2, and Th17 cells in graft-versus-host disease. Blood 114: 3101–3112.
. 2011. Prevention of GVHD while sparing GVL effect by targeting Th1 and Th17 transcription factor T-bet and RORγt in mice. Blood 118: 5011–5020.
. 1999. IL-5 mediates eosinophilic rejection of MHC class II-disparate skin allografts in mice. J. Immunol. 163: 3778–3784.
. 2002. Skin graft rejection elicited by beta 2-microglobulin as a minor transplantation antigen involves multiple effector pathways: role of Fas-Fas ligand interactions and Th2-dependent graft eosinophil infiltrates. J. Immunol. 169: 500–506.
. 1973. Primarily vascularized allografts of hearts in mice: the role of H-2D, H-2K, and non-H-2 antigens in rejection. Transplantation 16: 343–350.
. 2013. A color-coded reporter model to study the effect of immunosuppressants on CD8+ T-cell memory in antitumor and alloimmune responses. Transplantation 95: 54–62.
. 2013. Unconventional RORγt+ T cells drive hepatic ischemia reperfusion injury. J. Immunol. 191: 480–487.
. 2004. An essential function for the nuclear receptor RORgamma(t) in the generation of fetal lymphoid tissue inducer cells. Nat. Immunol. 5: 64–73.
. 2008. T helper 17 lineage differentiation is programmed by orphan nuclear receptors ROR alpha and ROR gamma. Immunity 28: 29–39.
. 2002. Distinct effects of T-bet in TH1 lineage commitment and IFN-gamma production in CD4 and CD8 T cells. Science 295: 338–342.
. 2007. Detection and quantitation of eosinophils in the murine respiratory tract by flow cytometry. J. Immunol. Methods 327: 63–74.
. 1999. Analysis of the Th1/Th2 paradigm in transplantation: interferon-gamma deficiency converts Th1-type proislet allograft rejection to a Th2-type xenograft-like response. Cell Transplant. 8: 365–373.
. 1995. In vivo depletion of CD8+ T cells results in Th2 cytokine production and alternate mechanisms of allograft rejection. Transplantation 59: 1155–1161.
. 1993. Evidence for a nonclassical pathway of graft rejection involving interleukin 5 and eosinophils. Transplantation 55: 909–918.
. 2008. CD8+ Th17 mediate costimulation blockade-resistant allograft rejection in T-bet-deficient mice. J. Immunol. 181: 3906–3914.
. 2009. Targeting Tim-1 to overcome resistance to transplantation tolerance mediated by CD8 T17 cells. Proc. Natl. Acad. Sci. USA 106: 10734–10739.
. 2008. T-bet and eomesodermin play critical roles in directing T cell differentiation to Th1 versus Th17. J. Immunol. 181: 8700–8710.
. 2006. Cutting edge: IL-12 inversely regulates T-bet and eomesodermin expression during pathogen-induced CD8+ T cell differentiation. J. Immunol. 177: 7515–7519.